What’s Happening to House Prices in Your Metro Area? In every one of the top 100 metros, average house prices are still falling. But the story is a lot grimmer in some metros than others, according to the Federal Housing Finance Agency’s metro-level house price numbers for Quarter 2 2011. 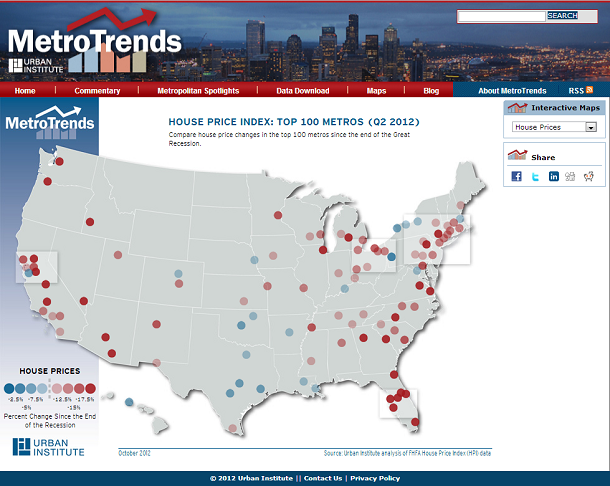 MetroTrends shows you the national picture and makes it easy to zoom in on the metros you care about. For example, compare Tampa to Oklahoma City. During the boom, house prices in the Tampa region sky-rocketed, while the Oklahoma City market remained flat. But over the past five years, house prices in Tampa have dropped 46 percent, compared to only 7 percent in Oklahoma City. And just over the last year, Tampa’s prices fell 12 percent, compared to only 2 percent in Oklahoma City. Although the average home has appreciated by about the same amount since the index first began tracking home values in these two metros, people who bought homes in Tampa during the boom are much more likely to find themselves underwater today. Click into our interactive map and see what you can learn from it.